April Shows, Come Get It! Helloooooo, April! As the cold weather is starting to recede, we're welcoming spring with these great shows below! Be sure to check it out! Normally we don't recommend Broadway shows but Dede is a real one so be sure to check out her big debut at Studio 54! Also, big THANK YOU to Monet Hurst-Mendoza for filling in for Maria! After reading Olivia's suicidal blog post, her estranged mother, Beatriz, travels to Philadelphia to pick her up from school and bring her back to California for a week. As the two journey west, what ostensibly began as a mother trying to help her daughter gets turned upside down when Olivia discovers that her mother is facing deportation. It is now Olivia that must help Beatriz but will she? Can she? Workshop productions of NYC's most exciting, emerging and established, female & trans playwrights. Every weekend during the month of April, you can see a new play in the early stages of development on the upper west side at WP Theater. This year's festival includes works by Donnetta Lavinia Grays, MJ Kaufman, Sylvia Khoury, Zoe Sarnak, and Leah Nanako Winkler. Performances are Thursdays to Saturday with tickets going for $25/$35. A $60 pass for the entire festival is also offered. The touching love story of James Leeds, a new teacher at a school for the deaf, and Sarah Norman, a deaf woman on the custodial staff, that begs the audience to really listen. 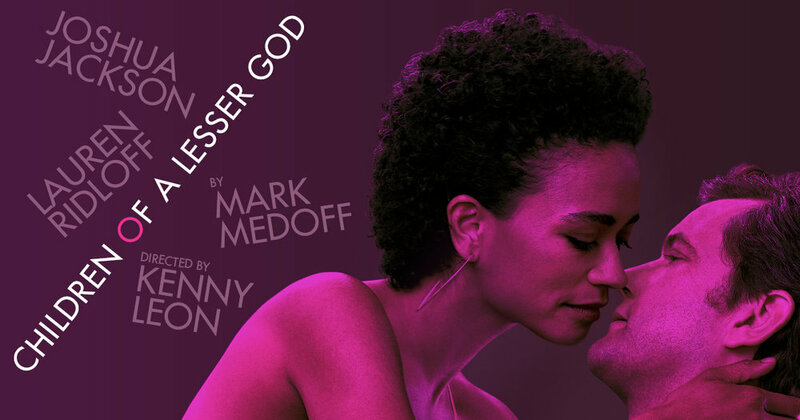 This 1980 Tony Award winner for Best Play is revived with Joshua Jackson and Lauren Ridloff. Each performance will offer either closed captions, supertitles, or ASL interpretations. Produced by Berkshire Theater Group, Roundabout Theater Co., Tamar Climan, Hal Luftig, and others. Show info, updates, and musings! April: The Public Theater shows! HAPPY (LUNAR) NEW YEAR AGAIN! The End (of the Year) is Nigh! Check out these great shows! JUNE SHOWS! HAVE A GREAT SUMMER!